Bean bags have come a long way. The various shapes and sizes available cater to a variety of everyday needs. 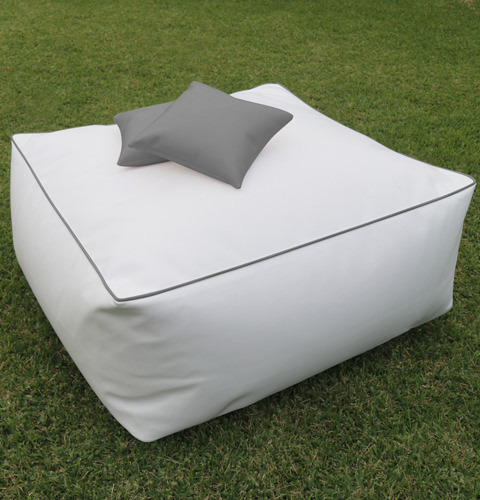 And ottoman bean bags are some of the most versatile pieces. Our Circular Bean Bag enables you to pull up a large stool for sitting on, standing on, or putting your feet up without straining to lift what would otherwise be a heavy furniture piece. No matter how much it is used, we have created this bean bag to keep its shape over time. The specialty material from which the bean bag is made – marine grade vinyl - comes in many vibrant colour combinations and has an extensive and impressive list of safety and hygiene features. The fabric is fire retardant, as well as mould proof and water proof, and it is stain resistant. It is held together by a safety zipper which ensures there are no spills, and has a feature to hide the zipper ensuring there are no sharp edges to snag on or scratch. It can even be used and left outdoors without ill effects. All these features make it the perfect safe, easy and fun furniture item to use if you have excitable children (or adults) around.